This was my first Deeanne Gist novel, but it won’t be my last. 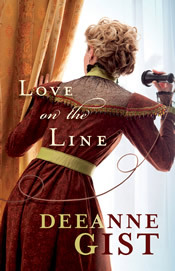 “Love on the Line” charmed me from beginning to end. The story’s authentic setting brings the entire town into the novel via the telephone “party line” and weaves breath-holding high tension and laugh-out-loud moments throughout the tale. However, what impressed me most about Deeanne Gist’s novel was her ability to create flesh-and-blood characters — real and believable people — from mere words and imagination. Not only are the main characters, Georgie Gist and Luke Palmer (actually an undercover Texas Ranger named Lucious Landrum), multi-dimensional and well-rounded, but the townspeople, the outlaws, and even the notorious bank robber, Frank Comer, come across as viable, multi-dimensional individuals. I highly recommend this book. About the Giveaway: CONTEST CLOSED! 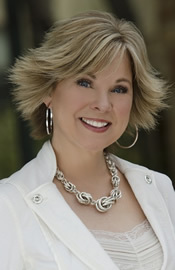 Deeanne Gist — known to her family, friends, and fans as Dee — has rocketed up the bestseller lists and captured readers everywhere with her very original, very fun historical & contemporary romances. Add to this three RITA nominations, two consecutive Christy Awards, rave reviews, and a growing loyal fan base, and you’ve got one recipe for success. This biography was provided by the author or her representative (via Amazon.com). Oh my, this is your first book by Dee? She has some great books and is such a sweetheart! I loved interviewing her in 2009. Linda — I do believe that interview is what lead me to decide to review books, too. I was unemployed so I was spending money only on authors I trusted to give good value. That means I wasn’t exposed to the work of anyone new to me, and I knew I was missing out. Book reviews seemed to me good way to feed my book habit, meet new authors, and save money — which it was. I just downloaded a free copy of Maid to Match. I’ve never read any books by Dee but this book sounds like a great read. I met her this past summer and she’s so nice.